Literature and Latte has released Scrivener 3.0 for OS X, a major new version of its writer-centric tool. The app combines traditional word-processing features with project management and organization tools to provide a one-stop shop for any writing project. Version 3.0 unveils a number of new and enhanced features, alongside an updated user interface, Touch Bar support and rewritten codebase for 64-bit. Scrivener 3.0 opens with what Literature and Latte describes as an "overhauled and modernized" user interface. Improvements include new draft and session progress bars in the main toolbar, a new Quick Search tool for finding documents within the current project and a new 'Copyholders' feature to refer to up to four documents in the main window. A new feature -- Bookmarks -- combines the content previously displayed under Project Notes, References and Favorites, giving users access to frequently used documents from the Inspector. Part of this update also sees a major redesign of the program’s Compile tool, which is used to transform the user’s drafts into a single, completed file. It’s been made easier to use, but also more flexible, particularly when combined with the text system’s new full styles system. The improved tool also improves its support for major eReader formats, with existing Kindle support enhanced and ePub3 added for the first time. Users can now also view index cards using colored threads based on label coloring, while a new Writing Statistics tool helps users determine how much progress they’ve made on a daily basis. Users can now add custom metadata in the form of additional checkboxes, dates and list boxes to the Inspector and outliner. The outliner also gains a filter, along with the corkboard. There’s also a new 'Dialogue Focus' tool for picking out dialogue in text. Support for technical formats has been improved too. Not only can users now export rich text to MultiMarkDown or Pandoc, there’s also the ability for Markdown output and custom post-processing. macOS improvements include extensive support for the MacBook Pro’s new Touch Bar, and a modernized and rewritten codebase for 64-bit to ensure future-proofing and better performance. 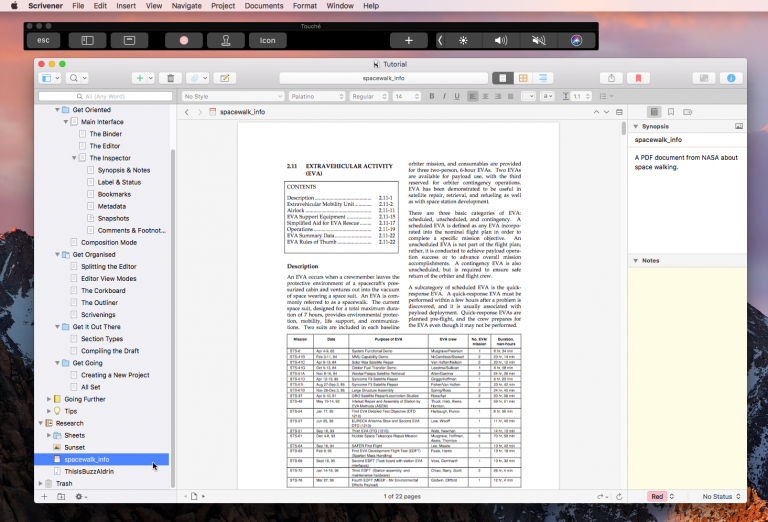 Scrivener 3.0 is available now as a free trial download for Macs running MacOS 10.12 or later. The full version costs $45, but existing users can upgrade through the program’s website (but not the App Store) for $25. Scrivener 1.9 for Windows is also available -- Literature and Latte reveals it will be updated to version 3 in 2018.